Public lands are treasured places to reconnect with nature and with each other. These lands, owned by all Americans, provide essential fish and wildlife habitat as well as incredible places to enjoy camping, hiking fishing, and other recreational activities. Unfortunately these lands are under threat by legislation, backed by corporate interests, which would loosen environmental protections and even transfer public lands to state ownership. Transferring public lands to states would lead to many of these lands being sold to private interests as the expenses to maintain these lands would overwhelm state governments. Mine Update: Green River Listed As Endangered! The Green River valley near Mount St. Helens is still under threat from a risky hardrock mining proposal. Due to this ongoing threat, the Green River was listed as #6 on America’s Most Endangered Rivers® 2017 by American Rivers. This mine would risk polluting public lands intended for conservation and recreation, and pristine waters providing important habitat for wild steelhead. We need your help to protect the Green River valley from mining! Read more about our listing and take action here. Connectivity is the ability of wildlife to move throughout the landscape and to access important patches of habitat. Connectivity can be impacted by roads, logging, development, changes in habitat type, and climate impacts on forests, streams, or species. Fragmentation of wildlife habitat and shifting plant and animal populations as a result of climate change will put the wildlife of the Pacific Northwest at risk. 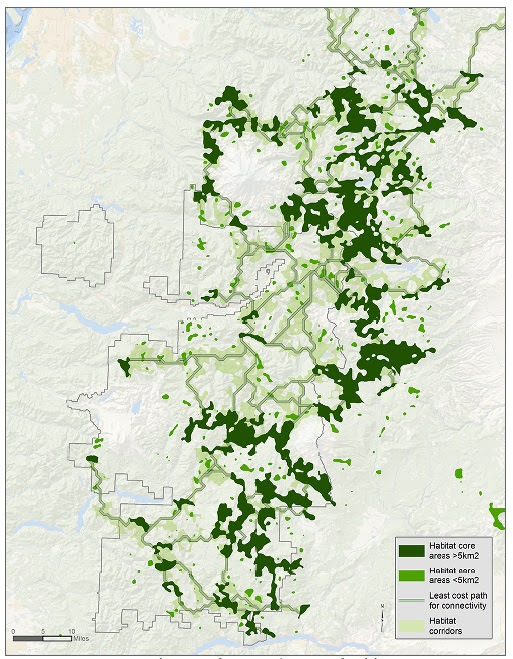 Understanding habitat connectivity and planning conservation actions accordingly is one of our goals at the Cascade Forest Conservancy, and can help mitigate climate impacts and help local ecosystems adapt. CFC’s Wildlife and Climate Resilience Guidebook (found here) outlines connectivity needs and highlights strategies for improving ecosystem resilience. Connectivity represents the critical arteries sustaining the ecosystem. 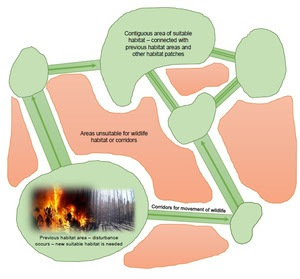 Robust connectivity throughout the landscape makes wildlife populations more resilient to climate impacts by allowing movement to alternate habitat areas and decreasing the degree to which disturbance in a particular habitat patch affects the overall viability of the population. As forest ecosystems move due to climate change, oftentimes shifting to higher elevations and northward, this forces species migrations and population shifts. These changes will be exacerbated and sometimes caused by local disturbances like wildlife or drought, and by the decoupling of species relationships. For example, as certain wetland vegetation disappears, the bird and insect species that depend on them also suffer and become scattered in distant patches. We must provide room to allow species and population movements to occur and not be hindered by geographic bottlenecks. CFC designed a region-wide connectivity analysis to assist in conservation planning and to help prioritize resilience-building efforts for species that live in old forest habitats. Our analysis identified core habitat areas and potential connectivity corridors. The parameters we set are broad enough to encompass many species yet focused enough to be effective for the individual conservation needs of each one. The species we considered for this connectivity analysis included: fisher, northern spotted owl, marten, northern flying squirrel, and pileated woodpecker. While the particular habitat needs and preferences of each species varies, there are commonalities and it is in this area of common ground where we focused our analysis. Mapping these patterns is an important step in understanding the need for and placement of habitat corridors and the areas where efforts are needed to protect, sustain, and improve connectivity. Although not explicitly modeled, this connectivity analysis should also provide connectivity for plants, insects, and other wildlife that depend on mature forest habitat. Moreover, the species we focused on often serve as dispersers of seeds and can therefore support plant populations and improve resilience through their distribution. If you are interested in learning more about habitat connectivity, download our Wildlife and Climate Resilience Guidebook [here], or go on one of our summer stewardship trips with CFC Conservation Science Director Shiloh Halsey!